Few things in life are as relaxing and enjoyable as watching birds in winter. Colorado provides a unique environment for up to 400 different species of birds. Many of these birds migrate through Colorado during the fall. Many more live here year-round. You and your family can watch birds in your own backyard by doing a few simple things make your garden more attractive to birds. Like all living creatures, birds need three things to survive: food, shelter, and water. Providing food for the birds is easier than you think. Like us, birds have their favorite kinds of food. Chickadees and finches, for example, like sunflower seeds. Steller's jays and blue jays prefer peanuts. White proso millet is the preferred food of juncos, sparrows, and mourning doves. The favorite food of pine siskins and some kinds of finches is the nyjer seed. Black oil sunflower seed is our favorite seed to feed in the winter because of its high oil content. Tidy Patio is a no-shell blend of seed so there is no mess under the feeder. Northern flickers prefer suet cakes. Put out some peanuts in the shell, some tree nuts, or raisins for special treats and watch the birds learn to come for them within minutes. Bird feeders come in many different shapes and sizes. Some feeders can be mounted on a pole. Others can hang from trees or shrubs, or from a porch overhang, or bracket on the wall. Another type of bird feeder is a simple ground-level platform made of a screen mounted on short legs. Regardless of the type of feeder you select, be sure to place the feeder where you can observe it from a window. Don't put it so close to the window that the birds hit the glass periodically. 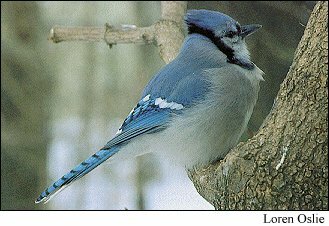 Birds prefer feeders that are placed near shrubs or trees that offer protection from predators. When choosing a feeder, make sure you choose one that is easy to fill and easy to clean. It should hold two or three days' worth of seeds. Most birds feed in the early morning and again at dusk, so make sure the feeder is full of seed. You don't want to miss the early morning antics while enjoying your coffee! Birds also need shelter from the elements and predators. Natural shelter is provided by having a variety of shrubs and trees in your yard. When planning your garden to attract birds and other wildlife, include a variety of evergreen and deciduous shrubs of different shapes and heights. You can also provide shelter by adding a bird house or two. Bird houses can be simple or complex and come in many sizes. Hole size is important in attracting specific kinds of birds. Make sure the house is equipped a removable panel so it can be cleaned between uses and a drainage hole so water doesn't collect in the house. Birds also need a year-round source of water. You can easily provide water for birds in a birdbath or simply by leaving a saucer full of water near the feeder. Electric de-icers can be used to keep the water from freezing. Birdbaths also provide a safe spot for birds to clean their feathers. Give your birds room to feed. Crowded bird feeders quickly become unsanitary as sick and healthy birds are pressed together. Clean off bird droppings as needed. Scrub the feeder with water using a brush with stiff bristles. To completely disinfect your feeders once a month use a 10% chlorine bleach solution (1 part Clorox & 9 parts water). Soak the entire feeder in a bucket or spray it until it the surface is soaked wet and let it sit 5 minutes. (Keep the solution off your skin and clothing.) Then rinse with water it and let it air dry before refilling. Keep the birds off the feeder until after it is rinsed. This process is much easier if you have more than one feeder and you can clean one and leave the other in use. Keep your seed dry and away from rodents. By following these easy guidelines, you can attract birds to your garden and be rewarded with years of relaxing entertainment.